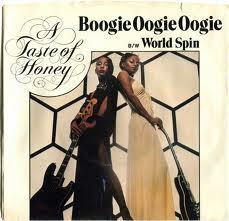 The year I was born, A Taste of Honey released this record. Twenty years later, I discovered it in a dusty music shop and sixteen years later it remains a loved part of my vinyl collection. The years keep going and now I am another age, something I never shy away from. How could I with all that the passage of time has allowed me, all of the hours and hours of learning and practicing of movement that only time will allow? And all of the refining and seasoning still to come. Dance and movement training can’t be rushed and rather than looking at time missed, I look forward to the learning, opening, and realizations that fluid movement will bring –not just in a studio, but in life. With people, on the dancefloor at 2am or waiting for a bus. The fluidity of movement is never to be taken for granted or confined only to the studio and stage. 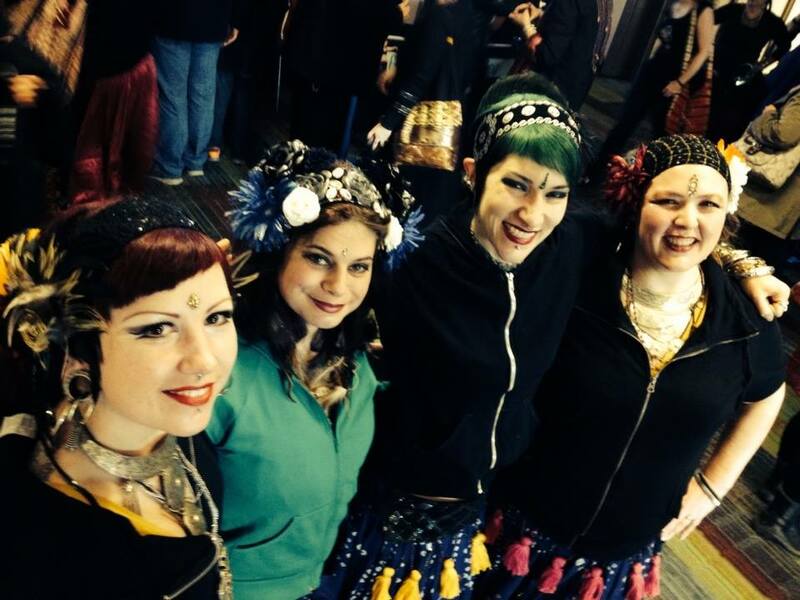 I’ve recently returned from Cues & Tattoos in Seattle, an improvisational bellydance (as in ATS and ITS) festival with Serpentina North Ensemble (minus two troupe mates who were greatly missed…next year ladies, next year!). After last year studying with Rachel Brice, Mira Betz and Carolena Nericcio, the expectations were high (see my post about last years festival here). My first workshop was with Amy Sigil of Unmata, a three hour primer on her signature super fast style of ITS. This was my first time learning from Amy and her teaching style is truly impressive, in its clarity, repetition and building on the fundamentals of ITS. Without a basic foundation in ATS, people may have been left tripping over their own feet. Fortunately most people there had ATS if not ITS in their repertoire, allowing us to pick it up with some level of ease. Not only did Amy teach us the fundamentals of her dialect of improv group dance but we were ‘tested’ when put into smaller groups to assume the lead position for all the moves we learned. My personal favourite is her version of the Arabic Twist, which when combined with quarter and half turns makes for a high impact set of moves. 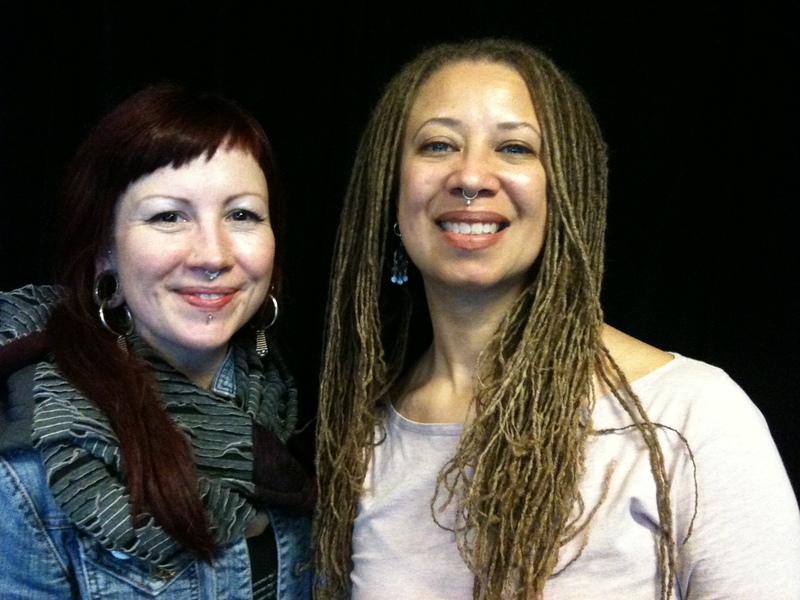 Later that afternoon I took another three hour with Donna Mejia, ‘Le Funk Arabi’. I did not know much about Donna and I’m so happy to have learned from her this weekend. As an ethnomusicologist, Donna’s knowledge of music, social issues and cross cultural dialogue informs her fusions in a deep and respectful way. The music in this workshop was all underground arabic hip hop and to this soundtrack we learned some combos infused with house, hip hop and bellydance. Her workshop the next day was a whole other flavour, looking at improvisational dance, not in the ATS sense but as in movement experiences that involve, as Donna put it, “the deliberate act of using the body over cognition.” Moving only slightly into the realm of contact improv, I can say that I felt the community of the room as more cohesive after this three hour session, due to I think the internal experience of tapping into our bodies and also connecting with others in an unstructured way. I couldn’t help but think, of the experience of a dancefloor in a social setting…mainly the kind of setting I have known a dancefloor to be: hours of music, mixed together into the longest song you can imagine. And all of the dynamics that happen as people move as a group, from intersection, repulsion, divergence, resonance –terms used in improv can also apply to the autonomous zone that is ‘the dancefloor.’ And that’s not even getting into issues of transcendence. I’ll save that for another entry. I got to work on some floor moves with Ashley Lopez in her “Floortastic” workshop. Lately I’m a super keener on floorwork, knee pads now a part of my bag-o-dance gear as I better understand the mechanics of dancing on your knees and dream up ways to incorporate it into my practice. My last workshop of the weekend was with Calamity Sam, who focused on non-choreographed performance and tips and tricks for addressing common issues that arise when there is no choreography to cling to. For the first time our ITS group Serpentina North Ensemble performed at the Cues and Tattoos, Serpents Muse. As the guidelines required at least 50% improv, we went with a choreographed entrance and moved into an upbeat improv set. It was awesome to finish our weekend up with a performance and for so many dancers. I think our biggest compliment had to be the woman who approached us just after our show, who said “I don’t bellydance, but watching your troupe made me want to.” While we train and practice and sweat over holding this still while hitting that beat with this part, etc…at the end of the day, if you make someone want to dance, that’s meaningful and deeply satisfying. On the plane home from Seattle I dreamt of the whole troupe being there next year and other adventures to come this summer. I schemed new things for my own practice and current collaborations. Although I don’t discount the local expertise to learn from and support here in Toronto, traveling for dance always brings its own unique set of insights and experiences. Ever unfolding. Previous Post The deep freeze. But still, music. Still, dance.